The excitement of Royal Ascot's second day sees the Queen Mary Stakes Group 2 (19th June, 2013). This 5f race for two-year-old fillies is named after Queen Mary the consort of King George V. The race was first run in 1921 with Wild Mint proving victorious. In 2004, the Queen Mary was upgraded from Group 3 status. From a historical perspective, Sir Gordon Richards is the leading jockey with 5 wins (Supervisor 1932 - Apparition 1946). While Fred Darling has trained 7 winners. 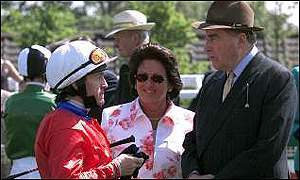 Since the 1990s Richard Hannon & Mick Channon have achieved great success with a number of talented fillies. This race has been a tip for future juvenile successes. Lyric Fantasy, Gay Gallanta, Blue Duster, Attraction & Queens Logic where all awarded the title of European Champion Two-Year-Old Filly. Many others have been made favourite for the 1,000 Guineas, including the ill-fated Bint Allayl, who was trained by Mick Channon. One of the most successful winner was seen in 2003. Attraction, a small filly with terrible conformation, trained by Mark Johnston and ridden by Kevin Darley, won by three lengths. This exceptionally gifted filly went on to win both English & Irish 1,000 Guineas. This Irish bred filly, owned by Lord Carnarvon & Susan Magnier, was trained by elite two-year-old handler Richard Hannon. She was bred by County Cork-based Minch Bloodstock. Although an early, January, foal, this bay daughter of Tate Gallery was often quoted as being ''small or tiny'' and fondly named ''The Pocket Rocket'' which illustrated her ample pace to diminutive size. Interestingly, Lyric Fantasy never raced at maiden class, starting her career at Windsor winning in the Lady Caroline Stakes in April, 1992. Clearly held in some regard by connections, she went to Sandown for the National Stakes Listed race. An impressive six length victory gave hope this was a juvenile of pure class. Royal Ascot beckoned and she was priced 11/8f for the Queen Mary Stakes. Michael Roberts led all the way for an ''impressive'' five length victory. She excelled with an all-age course record. In a bold move Hannon opted to go for the Nunthorpe Stakes Group 1 at York over 5f. Although two-year-olds have a handy weight advantage against their older counterparts, few took this route and winning a tough task. However, expectation was high for this tiny horse with an abundance of pace. Hold-up tactics were employed and Roberts' mount ran on strongly to win by half a length. Bookmakers quoted prices as short as 14/1 for the 1,000 Guineas although there were concerns she would never get the trip of one mile. Her final race of the two-year-old season saw her attempt six furlongs for the first time in the Cheveley Park Stakes Group 1 at Newmarket. In a small field of class performers she could never catch leader Seyyadati who had previously won the Moyglare Stud Stakes. Some questioned her race tactics of being held up. Lyric Fantasy was sent to the 1,000 Guineas for her first race at three. Her only attempt at one mile saw her finish sixth of twelve. She wasn't disgraced being beaten by less than four lengths behind Cheveley Park Stakes victor Seyyadati, trained by Clive Brittain. Dropping back for her next start over 6f saw a comfortable success. However, her last two performance back at 5f proved disappointing. She finished unplaced in the King's Stand Stakes at Royal Ascot & then last behind Lochsong in the Nunthorpe. She was retired with total prize earnings of over £320,000. Not bad for a yearling who was sold for 12,500gns. At the end of her two-year-old season she was sold for 340,000gns. In 1992 she was named European Champion Two-Year-Old Filly and highest rated by the International Classification.